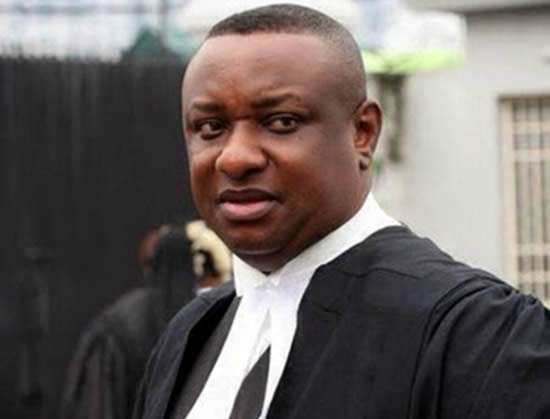 In the petition dated March 25, 2019, and addressed to the Inspector General of Police (IGP) and the DSS Director General, Festus Keyamo, spokesman of the APC Presidential Campaign Organisation, urged the security agencies to question the leadership of the PDP on their claims relating to the INEC server. Noting that Atiku Abubakar, the PDP presidential candidate, who rejected the outcome of the just-concluded presidential election, not only made "outlandish claims" in his case filed before the Elections Petition Tribunal, he also made reference to the INEC server. He, therefore, called on the security agencies to respond to the petition with "alacrity". The letter read: "It would be recalled that an Electoral (Amendment) Bill containing the provision for electronic transmission of results to INEC’s central computer system (otherwise called “server”) was sent to President Muhammadu Buhari by the National Assembly for assent late in the year 2018. Despite the shortness of time before the Presidential/National Assembly Elections, and the lack of time to first simulate the process to ensure its effectiveness in a country like ours with problems of effective networks in many rural areas and constant failure of technological devices, together with its violation of the time frame of such laws as provided for in regional and continental Protocols in terms of the length of time required for the passage of such laws before any major election, the leadership of the Peoples Democratic Party was hell-bent that the President should sign the Bill into law. "That was the first indication that the main opposition was up to something sinister regarding the electronic transmission of the results. Upon the last-minute postponement of the February 16, 2019 Presidential/National Assembly Elections, the nation was shocked to see already prepared presidential elections results floating around in the cyber space just less than 24 hours after the postponed election was originally billed to hold! The fake results had details of the scores of the candidates of the major parties. Of course, the fake results gave victory to the candidate of the PDP, Alhaji Atiku Abubakar, even when elections did not hold. The only conclusion one can draw from the above is that the PDP had prepared those results which were to be smuggled into the INEC Server. However, the sudden postponement of the election scuttled that evil plan, but it was too late to restrain the release of the fake results. "The proper elections were held on February 23, 2019 and President Muhammadu Buhari declared the winner. Despite the approval of the elections as credible by nearly all local and international observers (except some few known PDP acolytes masquerading as local observers), the PDP cried foul and made a shocking claim: it claimed that from purported results it obtained from INEC’s server, it has so-called proof that its candidate won the election by about 1.6million votes! Shockingly and coincidentally, this margin was about the same margin by which it also purportedly “won” by the fake results released just hours after the postponement of the February 16, 2019 Presidential/National Assembly Elections. As if this expensive joke was not enough, the PDP and its Presidential Candidate, Alhaji Atiku Abubakar, have gone ahead to file an Election Petition against the clear victory of President Muhammadu Buhari and have repeated the same outlandish claim of having access to INEC’s server which shows that they have some purported results at their disposal giving “victory” to Alhaji Atiku Abubakar. "Sirs, we wish you to note that INEC’s server is the back end of electronic records of INEC. This is not INEC’s website but its server! Although, the purported results have been conclusively shown by public engagements to be false and even ridiculous, especially as the total number of accredited voters is exactly equivalent to the purported votes of the APC and PDP candidates, this criminal claim of the PDP has revealed a few things: It is now clear that some criminally-minded PDP operatives have access to the INEC server to be able to smuggle in fake results into that server. The only means by which they could have access to the INEC server is by the criminal hacking of the server or through the criminal conspiracy of some INEC officials. "The APC Presidential Campaign Council hereby prays that the Inspector-General of Police and the Director-General of the Department of State Services use your good offices to investigate the hacking of and/or illegal tampering with the INEC server by the PDP. The leadership of the PDP must be invited, interrogated and investigated and those identified as perpetrators must be arrested and prosecuted. Opposition is healthy in a democracy but it is not a license for criminality and illegality. A country governed by laws cannot be blackmailed or cowed into indolence by the perceived underdog status of the opposition so as to condone such a blatant criminal claim by the PDP of having illegal access to INEC’s server. We trust you will act with alacrity."